Biomass collection involves operations pertaining to gathering, packaging, and transporting biomass to a nearby site for temporary storage. The amount of biomass resource that can be collected at a given time depends on a variety of factors. In case of agricultural residues, these considerations include the type and sequence of collection operations, the efficiency of collection equipment, tillage and crop management practices, and environmental restrictions, such as the need to control soil erosion, maintain soil productivity, and maintain soil carbon levels. Large square bales are made with tractor pulled balers. A bale accumulator is pulled behind the baler that collects the bales in group of 4 and leaves them on the field. At a later date when available, an automatic bale collector travels through the field and collects the bales. 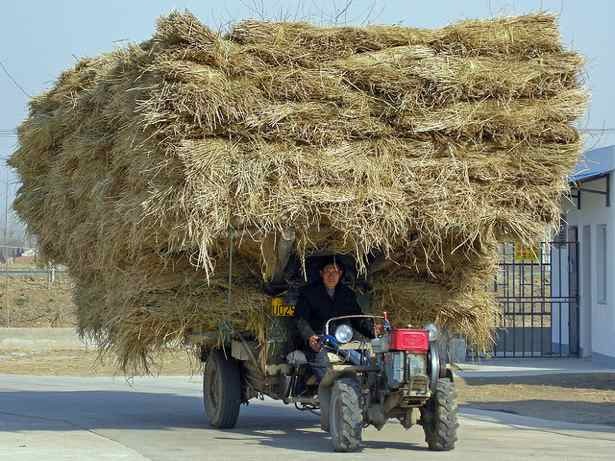 The automatic bale collector travels to the side of the road and unloads the bales into a stack. If the automatic bale collector is not available bales may be collected using a flat bed truck and a front end bale loader. A loader is needed at the stack yard to unload the truck and stack the bales. The stack is trapped using a forklift and manual labor. When biomass is dry, a loafer picks the biomass from windrow and makes large stacks. The roof of the stacker acts as a press pushing the material down to increase the density of the biomass. Once filled, loafer transports the biomass to storage area and unloads the stack. The top of the stack gets the dome shape of the stacker roof and thus easily sheds water. In this system a forage harvester picks up the dry biomass from windrow, chops it into smaller pieces (2.5 – 5.0 cm). The chopped biomass is blown into a forage wagon traveling along side of the forage harvester. Once filled, the forage wagon is pulled to the side of the farm and unloaded. A piler (inclined belt conveyor) is used to pile up the material in the form of a large cone. Here a forage harvester picks up the dry or wet biomass from the windrow. The chopped biomass is blown into a forage wagon that travels along side of the harvester. Once filled, the wagon is pulled to a silage pit where biomass is compacted to produce silage. The entire material (grain and biomass) is transferred to a central location where the crop is fractionated into grain and biomass. 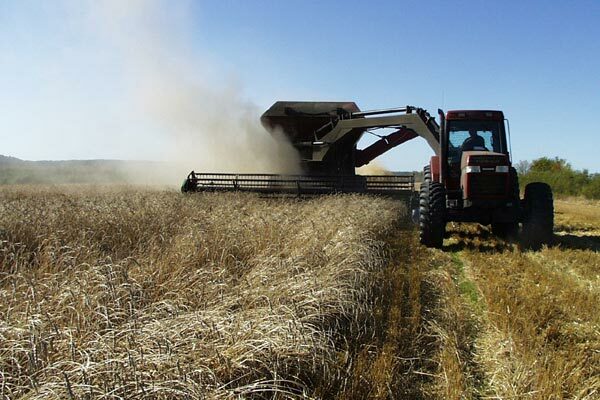 The McLeod Harvester developed in Canada fractionates the harvested crop into straw and graff (graff is a mixture of grain and chaff). The straw is left on the field. Grain separation from chaff and other impurities take place in a stationary system at the farmyard. For the whole crop baling, the crop is cut and placed in a windrow for field drying. The entire crop is then baled and transported to the processing yard. The bales are unwrapped and fed through a stationary processor that performs all the functions of a normal combine. Subsequently, the straw is re-baled.